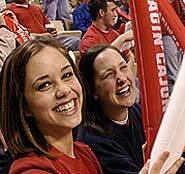 Cheer on Louisiana’s Ragin’ Cajuns as they open the home football season this weekend. Everyone is invited to the annual pep rally “Ragin’ Roar” on Thursday, Sept. 15. The fun starts at 7 p.m. in the Red Zone at Cajun Field. Food and soft drinks will be available and a D.J. will be playing music. For more information, call 482-6939.